FORT LAUDERDALE/DAVIE FLA. – Typically, parents are in the audience cheering as their child walks across the stage at commencement. But this Friday afternoon, the roles will be reversed at the Nova Southeastern University commencement ceremony in Davie. Brett Wilson, R.N., will beam with pride as his parents, Lisa and Scott Wilson, receive their Advance Practical Registered Nurse (APRN) master degrees. All three Wilsons, of Cape Coral, Fla., have prior nursing degrees from the university as well. As befitting NSU’s first family of nursing, Lisa, 49, and Scott, 51, will both go on to study for their Doctorate in Practical Nursing (DNP) degrees from the NSU Palm Beach campus, aiming for an August, 2020 graduation. At that time, Brett, is hoping to finish his APRN degree. “You could say that nursing is just in our blood,” said Lisa. She explained that once her career began, her husband and son became inspired to follow in her footsteps. “The nursing field offers job satisfaction and good employment opportunities and the advanced degrees open up teaching and administrative opportunities,” she explained. “I enjoy teaching and look forward to possibly setting up my own practice one day,” said Lisa, who works as a clinical supervisor at Lee Memorial Health Systems. Scott has been working full time on his degree, while Brett works as an emergency room nurse. Scott attributes the family’s success primarily to Lisa. “Our family has gotten this far in our education because Lisa has encouraged us all the way,” Scott proclaims. 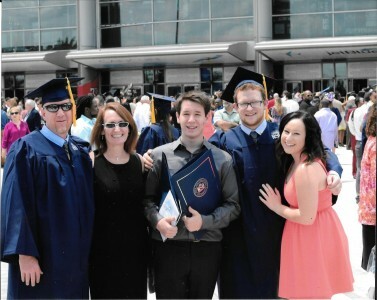 With Brett watching proudly, Lisa and Scott will walk for their degrees at 2:30 p.m. at the Ft. Lauderdale/Davie campus. About Nova Southeastern University (NSU): Located in beautiful Fort Lauderdale, Florida, NSU is ranked among U.S. News & World Report’s Top 200 National Research Universities and is a dynamic, private research university providing high-quality educational and research programs at the undergraduate, graduate, and first-professional degree levels. Established in 1964, NSU now includes 16 colleges, the 215,000-square-foot Center for Collaborative Research, a private JK-12 grade school, the Mailman Segal Center for Human Development with specialists in Autism, the world-class NSU Art Museum Fort Lauderdale, and the Alvin Sherman Library, Research and Information Technology Center, which is Florida’s largest public library. NSU has campuses in Fort Lauderdale, Fort Myers, Jacksonville, Miami, Miramar, Orlando, Palm Beach, and Tampa, Florida, as well as San Juan, Puerto Rico, while maintaining a presence online globally. Classified as a research university with “high research activity” by the Carnegie Foundation for the Advancement of Teaching, NSU is one of only 50 universities nationwide to also be awarded Carnegie’s Community Engagement Classification, and is also the largest private institution in the United States that meets the U.S. Department of Education’s criteria as a Hispanic-serving Institution. For more information, please visit www.nova.edu.